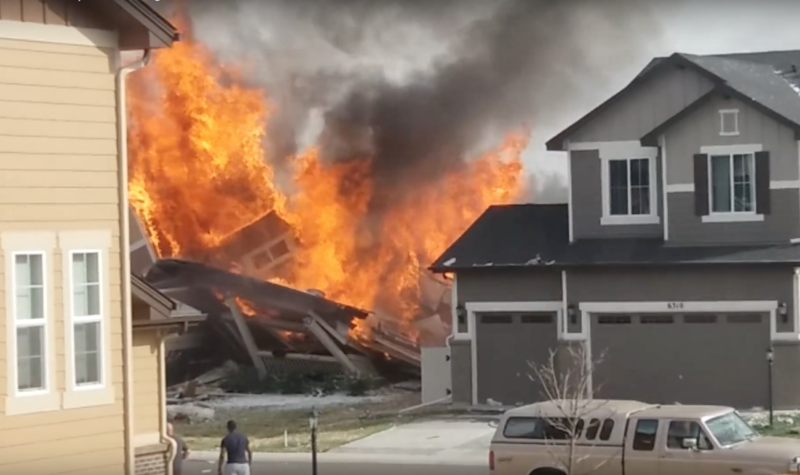 Fire burns a home just toppled by a natural gas explosion in Firestone, Colorado on April 17th, 2017. The blast was linked to a pipeline running from a nearby well. On the afternoon of April 17th, 10 year old Gillian Chapman and her little sister Kailey were on their front porch. Gillian had on her roller blades; Kailey had her scooter. They had just gotten permission to go visit their friend Jaelynn, across the street and two doors down. The explosion, in the northern Colorado town of Firestone, is prompting a lot of questions in the state about how oil and gas wells are regulated, and how close to old wells new homes should be built. The incident was linked to a leaking gas line running from a well 178 feet from the property. Within days after the incident, Governor John Hickenlooper ordered statewide inspections of all such lines, called flow lines, within 1,000 feet of occupied buildings within 30 days. Right now, there is no comprehensive state map showing where flow lines exist. Julia Chapman said when they bought their house a couple of years ago, neighboring oil and gas sites just weren’t something they thought about. Colorado’s population has increased by a half a million people since 2010 — bringing with it a lot of new home construction along the state’s clustered Front Range. Weld County, where Firestone is located, issued more than 5000 new building permits in the last 2 years. The northern Front Range also happens to be where much of Colorado’s oil and gas production is located. State data show that there are now some 54,000 active oil and gas wells in the state, and another 80,000 or so inactive and abandoned wells. This region in North Thornton, Colorado, which includes homes, parks, an elementary school and Wal-Mart Supercenter, has numerous wells that were spudded or drilled between 1972 and 1991, indicated with orange markers. Slide back and forth to see development between 2001 and 2015. Data sources: COGCC, Google Earth. Image credit: Jordan Wirfs-Brock. View high resolution images of this area. In this area of western Greeley, well locations are indicated with orange markers. The state wells database has no information on when many were drilled. This could be because they are old enough that they pre-date accurate record-keeping. A few wells were drilled or spudded in 2009 as well. Slide back and forth to see development between 1999 and 2016. Data sources: COGCC, Google Earth. Image credit: Jordan Wirfs-Brock. View high resolution images of this area. Shortly after the accident, Anadarko Petroleum shut down 3,000 wells in the area. Regulators insist there is no more danger for the surrounding properties surrounding the Martinez home. “I would say (with the heightened scrutiny) we’re probably safer now than we’ve ever been,” Julia Chapman said. But, more new homes keep going up. And while new oil wells must be drilled at least 500 feet from homes and 1,000 feet from buildings like homes and schools, there is no state regulation for the inverse — no rule for how far new homes must be built from existing oil wells. When asked about whether the state should enact these so-called “reverse setbacks,” Northern Colorado Homebuilders Association Executive Officer Gregory Miedema said the industry would be willing discuss anything that would keep confidence in the home buying public. “What they want to make sure is they don’t price the public out of a new home,” he said, explaining that any new regulations could shrink land available for new home construction, thereby raise housing prices. Read excellent, in-depth coverage of this issue from Mike Soraghan at EnergyWire. Check out Dan Boyce on KUSA 9 News with results from the investigation into the explosion.